Estate-bottled wine – an anomaly of the 20th century? Oenologist Lee Winston investigates. Until the early 20th century virtually all wine was shipped in bulk and bottled by the merchants who bought it. This included top-quality wines such as Bordeaux first growths – Château Margaux was still being shipped in bulk up to the 1948 vintage. Quality-focused producers then developed a penchant for estate-bottled wine and shipping in bulk fell out of favour. In the last couple of years, however, shipping wine in bulk has started to make a comeback. There are a number of reasons for this, the main one being fiscal, but there are also environmental and quality considerations. So why did bulk shipping fall out of favour? Back then it was not uncommon for merchants to adulterate the wine they bought and to make misleading claims of its provenance and pedigree. Wine adulteration hit a peak at the turn of the 20th century in the wake of the mass wine shortage caused by powdery mildew and phylloxera. But in the 1920s, in order to assure the quality and provenance of his wine, Baron Philippe de Rothschild began bottling at his estate – Château Mouton Rothschild. He also convinced the first growths to follow suit (at the time Mouton-Rothschild was a second growth). With these highly prized wines now being mis en bouteille au château, estate-bottled wine became synonymous with quality. Bulk wine became known for a lack of it. In some Old World appellations, such as Rioja, estate bottling is a requirement. The drive in the resurgence of bulk shipping is largely coming from Australia. Unfavourable exchange rates and increases in production costs, fuel prices and taxes have put an almost suffocating squeeze on the profit margins of Australian producers. Bulk shipping can potentially halve shipping costs. In the 1990s only 10% of Australian wine shipped to the UK was in bulk. In 2007, this increased to 20%, and, in 2010, reached 60%. New Zealand too has seen the volume of its Sauvignon Blanc being shipped in bulk jump from 4% to 30% in just a few years. There are also tax concessions for shipping in bulk from non-EU countries. The Common Customs Tariff (CCT) is reduced for containers with a capacity greater than two litres. • Bulk shipping greatly reduces environmental emissions, each flexitank shipped from Australia and bottled in the UK reduces CO2 emissions by 20 tonnes. Advances in flexitank technology have also allowed producers to be more confident in bulk shipping. Previously, high oxygen transfer rates (OTR) and contamination by organic substances, such as naphthalene, were a strong concern. However, this had changed remarkably in the last 15 years. In the 1990s, OTRs were 100-200 cc/m2/24hr; now they are less than 0.05 cc/m2/24hr. The new flexitanks also provide an effective barrier to organic substances eliminating the risk of airborne contamination. Another common reason given by winemakers for not shipping in bulk is that they lose control. In reality, though, the opposite is true. By bulk shipping they gain control. Things can be tweaked once the wine has arrived and put in bottle. A few examples: if the wine becomes reductive in transit, copper can be added to remove the volatile sulphur compounds; SO2 levels can be tweaked if they don’t arrive within spec; and wines can be shipped with extra CO2 for added protection which can then be sparged out before bottling. Winemakers that bottle in country of production before shipping lose this control. Additionally, once bottled wine is loaded on a ship all control is lost anyway (although the use of a refrigerated container will give some control over temperature). 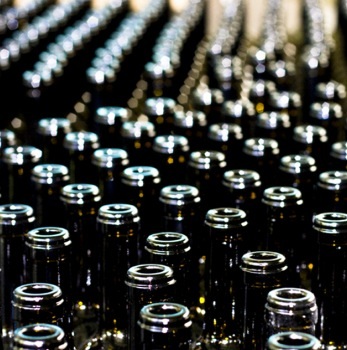 It seems inevitable that the shipping of bulk wine and bottling in the market of consumption will once again become the preferred method for economic, environmental and quality reasons. Indeed, history could show that the prevalence of estate bottling was just a passing fad of the 20th century. Volume is needed, though, to make bulk shipping logistically possible and cost effective. This may be an issue for producers of low-volume, super-premium wine but the likes of Château Margaux, averaging 150,000 bottles a year, could easily return to bulk shipping and assure quality and value for money for their Chinese and American customers. Would be very interested in Paul Pontallier’s view of this…. This is an opinion piece by oenologist Lee Winston, as is made clear in the lead paragraph.